As a Malaysian who has lived overseas for most of his adult life, the last two decades spent in Indonesia, Unspun cannot help but marvel at the racial divide in Malaysia, even during a unifying event such as Bersih 4, that took place over this weekend. For those not familar with Malaysian politics Bersih 4 is the wildly successful and popular rally of Malaysians over the weekend to protest the rotten system of political patronage and corruption among the elite in Umno entering on its leader and Prime Minister Najib Razak (for a primer on this issue see here). So hundreds of thousands of Malaysians turned up for the rally in Kuala Lumpur over the weekend. Smaller groups of Malaysians all over the world also gathered in their cities to show support and solidarity with their compatriots. This included Jakarta that held their gathering at a restaurant at Epicentrum (see photo below). 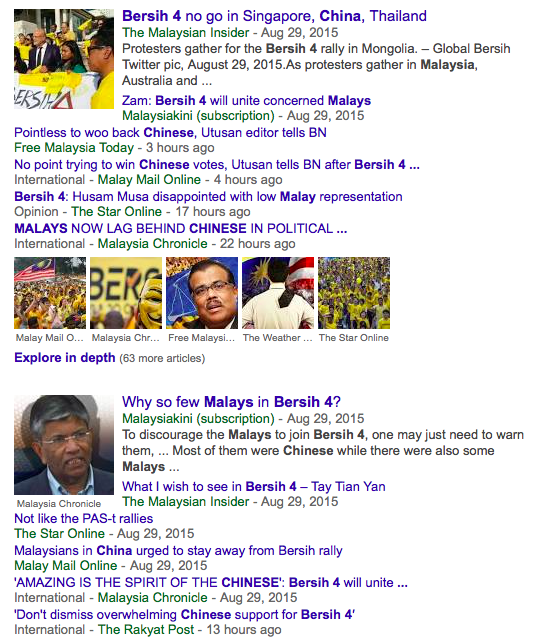 What’s interesting is how one major threat of the conversation about Bersih 4 is going. And it’s all about race. There are those that say that most of the protesters in Kuala Lumpur are of Chinese descent, and that those of Malay descent were under represented. (But I do a disservice to the Malaysian nomenclature – careful phrasings of Chinese descent, ethnic Chinese and ethnic Malays are all abbreviated into Chinese and Malays). Such observations have given rise to inferences and polemic. Some say that this reflect the political conservatism of the Malays, others say that the Chinese have now become politically dominant at the expense of the Malays; still others disagree and say that the Malays were actively participating, that the overwhelming population in Kuala Lumpur is Chiese, and that many Malays earned less and therefore they had to work serving everything from KFC to McDonalds to Starbucks to the bearish 4 protesters. Without getting into the merits of their inferences, Unspun it is telling about Malaysian society how race remains the single most important factor of their lives. It is difficult to imagine such conversations gaining so much play in Indonesia, where protests can happen often and often with the numbers that can make even the Bersih 4 rally a middling event. That Malaysians are so aware of their race is a testament of how damaging and polarising the Government’s policies have had on the populace. Everything revolves around race and interpreted through the racial prism. Even the most well meaning Malaysians who proclaim that they did not see Malays, Chinese or Indians among he protesters but only Malaysians belie the fact that they are conditioned by this polarisation to have such mindfulness of race. So where does this leave Malaysia, assuming the Bersih 4 protest achieves its objective and they get rid of Najib? A bit of a better place but still sitting on a powder keg. Race is polarising, emotive and easily stoked as an issue. It is so entrenched that it will take much effort and many years to undo the harm that the Umno-led government (beginning with Mahathir Mohamad) has done. But it needs to be addressed. So perhaps when Najib is shoved aside the focus should move toward a depolarisation of race, rather than anything political on the agenda? 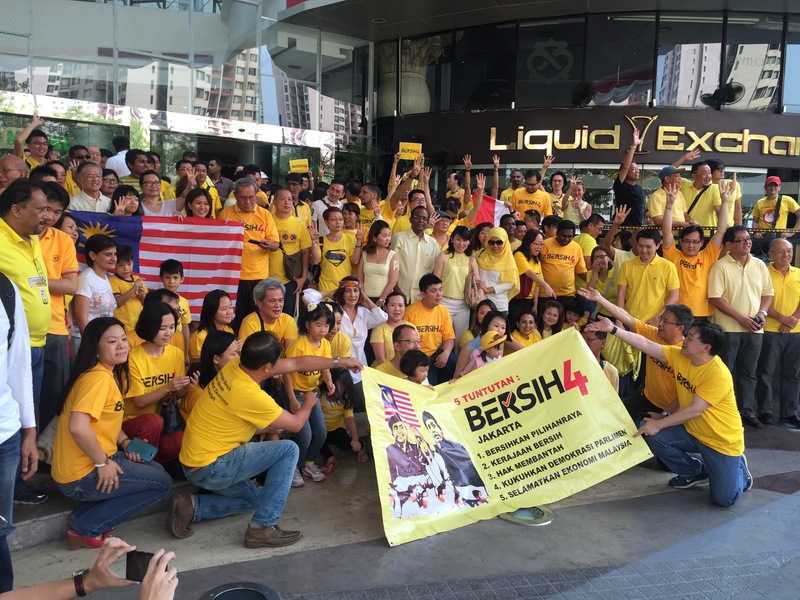 Light at the End of the Road for Bersih?